We have been distributing WorkersWildWest to supermarket delivery workers at ASDA and Ocado in Park Royal and Tesco in Greenford for some time. Their work is usually invisible, customers click on some icons on the internet and as if through magic their shopping appears on their door step or on their kitchen table. Behind all this is a lot of hard and badly paid work. We spoke to some Tesco workers - there are more than 1,300 of them at Greenford warehouse, around 500 of them drivers. The working-times are tough, some shifts start 2am or 3am. We pick shopping items for around 3,000 customers every day. Most guys are on part-time contracts, so hours are not guaranteed, but management wants people to stay longer if needed. Folks have to pick items using a ‘pick-stick’, which tells them the location. The target is around 190 items per hour, which can be hard. You can see on the stick if you are on target or not, if not you will be called in. In the summer the warehouse is very hot, people faint. Wages are pretty low, around £8.60 - Wincanton/Sainsbury workers next door get £10 for the same type of job. They also cut the Sunday bonus from 1.5 to 1.25 recently. The shopping trays that are loaded into the vans can get pretty heavy. Tesco guidelines say around 13/14 kg per tray, but there are often heavier trays. The vans are high, so you have to load over-head. People get back and shoulder problems, plus there is the pollution from the vans in the yard. A bigger group of loaders signed a petition against heavy trays and demanded scales for the loading bay. Management listens for a while, but you still get overweight trays. Management also asks loaders to work as drivers when needed, but give little back in return. Vans carry up to 850kg shopping, 10 to 14 deliveries in four hours. Management has introduced a new program called Bumblebee, that calculates how many deliveries can be made per hour. This increased the deliveries. Especially in central London it can be near to impossible to make more than two, three deliveries per hour. This forces you to work overtime or to bring shopping back, if you run out of time. If you bring shopping back management looks at your GPS data and might call you in. There are a lot of accidents, mainly when carrying the trays to the customer's kitchen. A lot of staircases and hall ways are narrow and dark. Delivery drivers from other companies don’t deliver into the kitchen or on the fourth floor with no lift. And they get paid better. Tesco are on £9.30 something, most other drivers at different companies get at least £10. A lot of new drivers don’t stay longer than three, four months. Instead of paying drivers more, Tesco spends thousands of pounds training people (for one week) who leave shortly after. But drivers have potential power, by just sticking to company, health and safety and traffic rules. If drivers would only carry one tray a time, do all van checks required, park the van only where they are allowed to park etc. 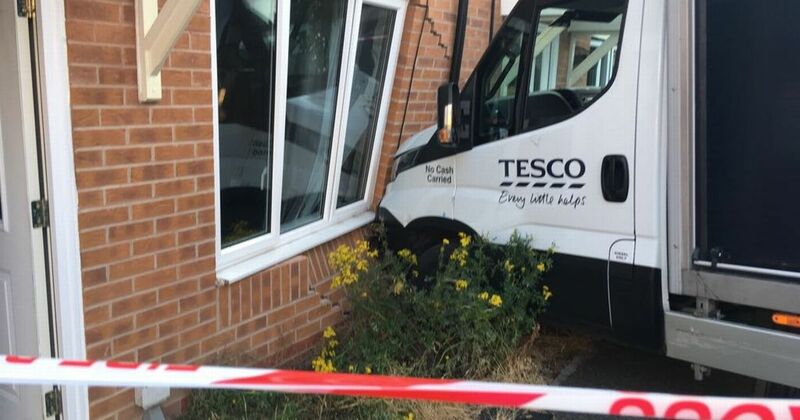 work would slow down and Tesco would probably listen more carefully to what drivers are unhappy with. We spoke to Ocado workers who are better paid, but who often have even more deliveries. Ocado gives them a company phone, which sounds good, but they have to use it to print their own manifest and they have to call customers themselves. There is less management at Ocado in Park Royal, drivers have to do these extra tasks. All supermarket delivery workers in London should coordinate a campaign for £13 an hour minimum - a big, but not impossible mission. There are unions at both Ocado (Unite) and Tesco (USDAW), but their hands are tied to the company - workers themselves would have to force them to do things. There are unions at both Ocado (Unite) and Tesco (USDAW), but their hands are tied to the company - workers themselves would have to force them to do things.